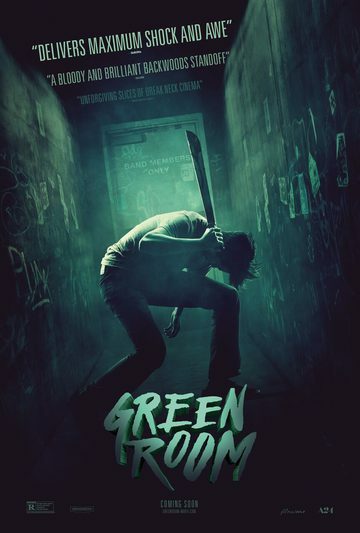 Green Room is a brilliantly crafted and wickedly fun horror-thriller starring Patrick Stewart as a diabolical club owner who squares off against an unsuspecting but resilient young punk band. Down on their luck punk rockers The Ain’t Rights are finishing up a long and unsuccessful tour, and are about to call it quits when they get an unexpected booking at an isolated, run-down club deep in the backwoods of Oregon. What seems merely to be a third-rate gig escalates into something much more sinister when they witness an act of violence backstage that they weren’t meant to see. Now trapped backstage, they must face off against the club’s depraved owner, Darcy Banker (Stewart), a man who will do anything to protect the secrets of his nefarious enterprise. But while Darcy and his henchmen think the band will be easy to get rid of, The Ain’t Rights prove themselves much more cunning and capable than anyone expected, turning the tables on their unsuspecting captors and setting the stage for the ultimate life-or-death showdown.